1. 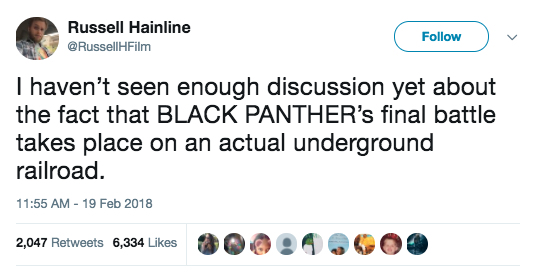 The final battle in Black Panther takes place on a literal underground railroad. 2. There are a lot of visual similarities to The Lion King. 3. The self-lacing shoes Shuri creates for T'Challa are a reference to the self-lacing shoes in Back to the Future Part II. She even calls BTTF Part II, "that old American movie" T’Chaka used to love watching. 5. And it turns out those sandals that Shuri makes fun of are actually Alexander McQueen shoes! 6. Also, when Shuri calls Everett "another broken white boy for us to fix" she's referring to Bucky Barnes. We saw him (and Captain America) in Wakanda in a post-credit sequence in Civil War. 7. 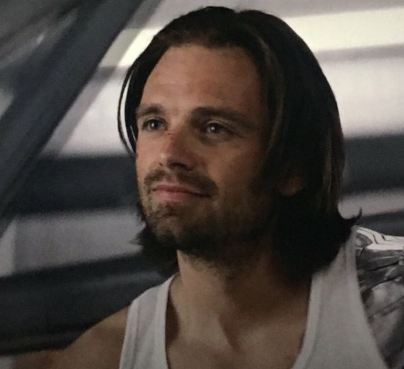 And, in the second post-credit sequence of Black Panther, when the children call Bucky Barnes the “White Wolf," this is a reference to T’Challa’s adopted brother in the comics. 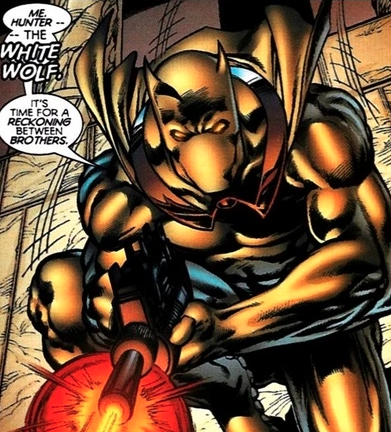 In the comics, White Wolf is a character who is orphaned in Wakanda after his parents die in a plane crash — so, make of that what you will. 8. Young T’Chaka is actually played by actor John Kani’s (T'Chaka) real son Atandwa Kani. Thus explaining the perfect likeness! 9. Stan Lee's credit in this film was "Thirsty Gambler." 10. Ryan Coogler explained that James Bond actually had a pretty strong influence on the film. For example, Shuri is like Q, the casino was reminiscent of Skyfall’s casino, and Everett is the classic buddy CIA operative. 11. T’Challa throwing himself on a grenade is a callback to a similar sequence in Captain America: The First Avenger. If you remember, Steve Rogers performed a similar selfless act. 12. Shuri’s lab is on "Mount Bashenga," which is named after the first Black Panther (from thousands of years ago). 13. T’Challa’s fight with M’Baku took place at dawn (symbolizing a new beginning), while his fight with Killmonger happened at sunset (symbolizing his downfall). Also, Killmonger throwing T'Challa off of a waterfall is straight from the comic books. 14. Killmonger says his allies are in London, New York, and Hong Kong...which happen to be the same cities where Doctor Strange has sanctums. 15. At one point, Shuri wears her hair in two buns, a nod to fellow Disney princess, Princess Leia's look in A New Hope. Maybe Shuri will become a general someday, too?! 16. When T'Challa, Okoye, and Nakia are in the casino, they're wearing red, black, and green — i.e. the colors of the Pan-African flag. 17. Donald Glover is mentioned in the end credits because he gave Ryan Coogler notes on the script. 18. Black Panther's cinematographer, Rachel Morrison, is the first female director of photography to receive an Oscar nomination (for Mudbound). Morrison also shot Coogler’s critically acclaimed Fruitvale Station. 19. Rapper Wale makes a brief cameo in the film. 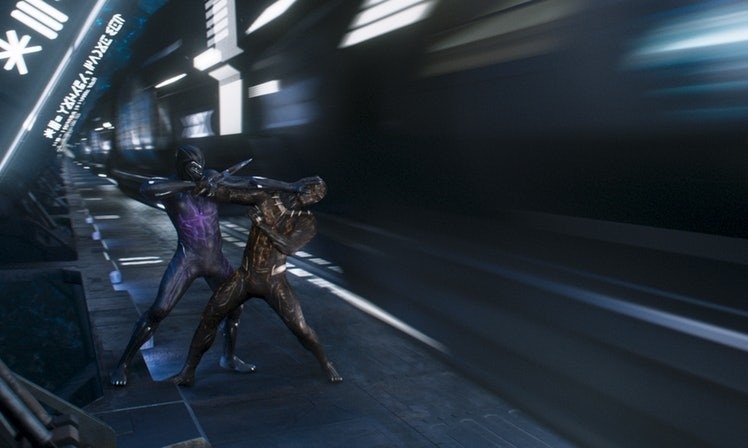 The cameo happens near the beginning of the film when T'Challa is walking through the streets of Wakanda. 20. It's hard to see, but during the interrogation of Ulysses (Andy Serkis), it looks like a bearded Captain America appears on one of the screens in the background. Steve Rogers, is that you? 21. And finally, Killmonger and T'Challa cradled their respective dead fathers in a similar fashion. Killmonger held his father N'Jobu (Sterling K. Brown) the same way T'Challa held T'Chaka in Civil War.